Are New Jersey public school teachers overcompensated? How do public school teachers compare with other New Jersey employees in terms of pay equity across gender, racial, and ethnic categories? Does participation in unions increase public school teacher compensation? New Jersey public school teachers are in fact undercompensated, not overcompensated. Using regression analysis to control for level of education and other factors that affect pay, we find that public school teachers earn 16.8 percent less in weekly wages and 12.5 percent less in weekly total compensation (wages and benefits) than other full-time workers in New Jersey. The percent by which teacher pay is less than pay of comparable workers is called the teacher pay penalty. An analysis of hourly compensation shows the teacher pay penalty at 13.7 percent for wages and 9.4 percent for total compensation. Female, black, and Hispanic public school teachers enjoy greater pay equity compared with the rest of the labor market in New Jersey, in part because of the transparency afforded by collective bargaining agreements. Female public school teachers earn 5.4 percent less than their male counterparts, while among other full-time workers, women earn 22.1 percent less. Blacks and Hispanics, respectively, earn 6.1 percent and 1.7 percent less than whites among public school teachers but earn 13.8 percent and 21.4 percent less among other full-time employees. Teachers’ union membership in the United States produces measurable earnings improvements for union members, acting as an important counterbalance to the teacher pay penalty. Teacher union membership on average results in 13.2 percent higher wages and 13.5 percent higher total compensation for union members when compared with the compensation of public school teachers who are not union members. New Jersey’s public education system ranks second in the nation—only behind Massachusetts—in both overall performance and student success (Education Week Research Center 2016), and it receives the lowest percentage of its revenue from the federal government (4.1 percent) than any other state (U.S. Census Bureau 2015). In many ways New Jersey schools demonstrate the success of the public education model. Nevertheless, New Jersey public schools, teachers, and teachers’ unions have come under harsh and unrelenting criticism since the election of Chris Christie as governor of New Jersey in November 2009. The new governor immediately went on the attack, blaming the state’s relatively high local property taxes, the state’s poor public finances and declining credit ratings, and the massive public pension deficit on what he has alleged are self-serving, overcompensated, incompetent teachers (Spina 2011) who resist all efforts at school reform (Arco 2015) and who deserve a “punch in the face” (Layton 2015). At the same time the governor has been attacking public school teachers and teachers’ unions, he has been championing the expansion of nonunion charter schools. While charter schools have faced resistance in the suburbs, the number of charter schools in old industrial cities with high rates of poverty has been steadily increasing. Approximately two-thirds of the 89 New Jersey charter schools (New Jersey Charter Schools Association 2017; author’s calculations) are now located in these cities. In 2011 Governor Christie, with the support of the state legislature, passed a massive public employee benefit reform bill (Chapter 78) that substantially shifted the cost of benefits onto teachers and other public employees (New Jersey Division of Pension and Benefits 2011). Teachers now pay a majority of the normal costs of their pensions. New Jersey teachers and other New Jersey public employees also contribute more to their health insurance premiums than most other state government employees in the United States (Magyar 2014). This shift in benefit funding has ensured that many teachers have not received an increase in take-home wages since its passage. Are New Jersey public school teachers overcompensated at the expense of New Jersey taxpayers, as Governor Christie alleges? How do public school teachers compare with other New Jersey employees in terms of pay equity across gender, racial, and ethnic categories? Teaching is a predominantly female profession and as such is gender-typed, which lowers both female and male teacher compensation. However, we also explore the gender, race, and ethnic differentials among New Jersey teachers and how they compare with other full-time New Jersey employees. Do unionized public school teachers benefit from collective bargaining in terms of wages and benefits when compared with nonunion public school teachers across the United States? The answers to the second and third questions help us to better understand the impact of teachers’ unions and the consequences of abolishing them (or of eroding their power through a shift toward nonunion schools). In order to respond to the question of whether teachers are overcompensated, we first look at education levels, which are considered the most important predictor of earnings levels. We find that public school teachers in the state of New Jersey are substantially more educated than other full-time employees in the New Jersey labor force. Approximately 98.7 percent of full-time New Jersey public school teachers hold at least a bachelor’s degree, compared with 46.9 percent of other full-time employees. However, the distribution of educational degrees is different. Public school teachers are nearly four times as likely to hold a master’s degree (49.0 percent vs. 12.4 percent). On the other hand, they are less likely to hold professional degrees (1.8 percent vs. 3.0 percent) or doctoral degrees (1.0 percent vs. 2.0 percent). The overall higher education levels of teachers would suggest that their compensation should also be higher. Yet even without controlling for education and experience or other factors, New Jersey full-time public school teachers are paid 16.9 percent lower salaries ($68,301 vs. $82,223) and 10.5 percent lower total compensation ($95,703 vs. $106,912)—salary plus benefits—than other full-time employees. We further find that when we control for education, experience, gender, race, ethnicity, citizenship, marital status, and weeks worked per year, the weekly wage earnings of full-time New Jersey public school teachers are significantly lower than those of comparable full-time employees. The teachers earn 16.8 percent lower weekly wages and, when we add a control for weekly hours of work, they earn 13.7 percent lower hourly wages. The teachers do receive better benefits than other full-time employees, particularly better health benefits. Nonetheless, these superior benefits do not fully offset the lower wages results: weekly total compensation (including benefits and pension contributions) is 12.5 percent less than that of comparable full-time employees. When we control for annual hours of work, New Jersey public school teachers receive 9.4 percent less in total compensation than comparable full-time employees. All metrics yield one unmistakable conclusion: New Jersey public school teachers are undercompensated—they face wage and compensation penalties for being teachers. 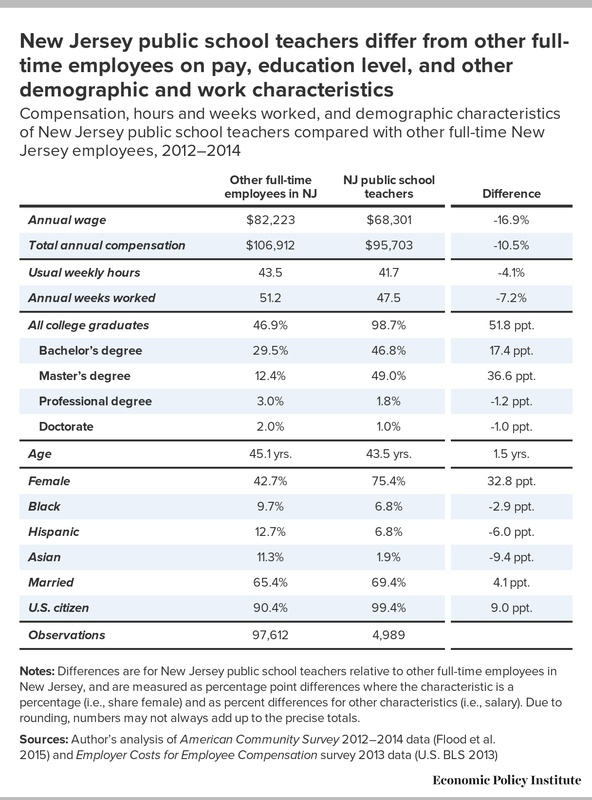 To answer the question, “How do public school teachers compare with other New Jersey employees in terms of pay equity?” we also explore the gender, race, and ethnic differentials among New Jersey teachers vs. other full-time New Jersey employees. More than three-quarters (75.4 percent) of New Jersey public school teachers are women. Gender segregation has probably contributed to reduced teacher earnings overall; however, even after controlling for gender, we find teachers earn less than comparably educated and experienced workers. Male teachers face a substantial 35.9 percent wage and 31.5 percent total compensation penalty for being teachers compared with other full-time male employees. However, within the teaching profession in New Jersey, there is considerably greater gender equity than in other professions: female public school teachers earn 5.4 percent less than their male counterparts, while among non-teacher full-time workers, women earn 22.1 percent less. There is also less wage discrimination against blacks and Hispanics among New Jersey public school teachers compared with employees in the rest of the labor market: blacks and Hispanics, respectively, earn 6.1 percent and 1.7 percent less among teachers but earn 13.3 percent and 21.4 percent less in fields outside of public school teaching. To investigate the impact of unions on teacher compensation, we compare the earnings of union and nonunion teachers across the United States. In comparing union and nonunion teachers, we control for education, experience, gender, race, ethnicity, marital status, and weekly hours of work. The results indicate that, in the United States, teacher union membership on average results in 13.2 percent higher wages and 13.5 percent higher total compensation for its members when compared with the compensation of public school teachers who are not union members. Are New Jersey public school teachers overpaid? Does a systematic evaluation show that New Jersey’s public school teachers are overpaid to the detriment of the state’s taxpayers? Our research seeks to methodically answer that question. To assess whether New Jersey public school teachers are overpaid, we first need to ask two questions: compared with whom and comparing what? When looking at the question of teacher pay, it might seem logical to compare public school teachers with private school teachers with similar levels of education, experience, and hours of work. However, this comparison is inadequate to the task. Private school teaching differs significantly from public school teaching; too many critical aspects of public school teaching lack private school analogues. Public schools accept all students, while private schools are often highly selective and may exclude or remove poor-performing, special needs, or disruptive students. Class sizes tend to be larger in public schools, and the workday and work year is longer. A better alternative—and one that is consistent with the standard approach to such questions—is to compare public school teachers with other full-time workers who have similar “human capital” (fundamental personal characteristics and labor market skills). Analyses based on comparisons of personal characteristics and labor market skills capture what comparable studies have shown to be the most important and salient attributes affecting compensation. Existing research reveals that education level is the single most important earnings predictor. Education helps foster work-relevant skills. People invest heavily in their own and their children’s education by paying for housing in communities with good schools, paying for private school tuition, and funding the pursuit of college, university, professional, and advanced degrees. Empirically, experience is the second most significant earnings predictor. People learn by doing and by handling a variety of job tasks as they advance within occupations. Most occupations reward experience, since on-the-job learning leads to greater competency and the ability to perform tasks of increasing complexity. Gender, race, and ethnicity are also widely found to influence compensation. Here, compensation is affected by an intermingling of productivity-related human capital differences and labor market disadvantages stemming from historical patterns of discrimination. We control for all these factors in our study. When making wage comparisons, most studies exclude part-time workers because their hours vary, they earn considerably less than comparable full-time workers, they are more weakly attached to the labor force, and they often lack benefit coverage. This study follows standard practice by focusing on full-time employees who are employed at least 35 hours per week, a group that represents 80 percent of New Jersey’s wage earners, according to the American Community Survey (Flood et al. 2015). This study focuses on full-time employees and teachers who are employed at least 39 weeks per year. Full-time, full-year workers exhibit greater labor attachment and experience. In addition to defining who will be compared, we must also define what to compare. It is not sufficient to simply compare wages, since the employer’s costs also include employer-provided nonwage benefits. Whether an analysis examines wages or benefits, the essential issue in making a comparison is to identify the incremental costs an employer or school district incurs to employ an employee. Employer costs in addition to wages may include paid time off for holidays, vacations, and personal and sick days; supplemental pay, including overtime and bonuses; insurances, particularly health insurance but also life and disability insurance; retirement plan contributions to either defined benefit or defined contribution plans, including 401(k) plans; and legally mandated benefit contributions such as unemployment insurance, Social Security, Medicare, disability insurance, and workers’ compensation insurance. These costs must be considered when computing the total compensation of an individual employee. To obtain wage and demographic data, we use the American Community Survey (ACS), an annual population survey conducted by the U.S. Census Bureau. For the purpose of comparability, we extract New Jersey data that includes all full-time, full-year wage and salary employees (that is, it excludes the self-employed, part-time workers who work less than 35 hours per week and employees who work less than 40 weeks per year). Wages include earnings before taxes or deductions that appear in employees’ paychecks. We enhance the reliability of the sample by expanding the number of observations to include 3 years of data from ACS survey years 2013 through 2015. Given that the data is retrospective with respondents reporting their prior year wage and salary earnings, the ACS data reports earnings for the years 2012 to 2014. Nonwage benefits represent a substantial portion of employee compensation costs incurred by an employer. Nonwage benefit growth has been partly fueled by the tax deductibility of health insurance payments and pension contributions, which allows employers to compensate employees without either the employer or the employee paying income tax at the time of compensation. This is sometimes referred to as “tax-efficient” compensation, and the federal government foregoes $300 billion annually in income tax revenue to subsidize these benefits (U.S. Congress Joint Committee on Taxation 2006). Health insurance and pension benefits are particularly attractive to middle- and upper-income employees, who face higher marginal income tax rates. Public school teachers’ pension and retiree health benefits have historically been provided in New Jersey through state-funded plans. Active employee health benefits are funded at the local district level either via a private health insurance plan, a state health insurance pool, or other insurance pools. The passage of Chapter 78, which became effective June 28, 2011, radically departed from the state’s benefit history by imposing significant cost shifting onto government employees (Chapter 78, P.L. 2011 [Approved June 28, 2011], Senate No. 2937, State of New Jersey). For teachers, this means on average a 22 percent contribution of the premium costs for family health insurance and 7.5 percent of salary contribution by 2018 to the pension plan, which constitutes two-thirds of the total cost of the required pension contribution (NJEA 2016). These increases in benefit costs have meant that for many New Jersey teachers, their take-home pay is less in 2016 than it was in 2011 before Chapter 78 went into effect (NJEA 2016). In spite of this cost shifting, New Jersey’s pension system faces a continued underfunding crisis, arising from 20 years of the state government’s failure to make its annual required contributions (ARC). Nonetheless, teachers receive better health benefits both for active employees and retirees than private-sector employees, reflected in the greater share of compensation costs for insurance (which is primarily health insurance), according to the Employer Costs of Employee Compensation survey data available for the Mid-Atlantic states, and they receive retiree health insurance (not included under “Insurances”) representing 3.0 percent of their compensation (see Table 1). They, however, no longer receive relatively better pensions or other benefits, as discussed below. Adjustments are made in Table 1 (in the row “Revised public school teacher data”) to account for the normal cost of the pension paid by the state and the addition of costs for retiree health benefits. What does distinguish the teachers’ benefits mix is that they receive a defined benefit pension, instead of the more common 401(k) received by private-sector employees. Defined benefit pensions are designed to impose relatively high costs on employees as a result of employee turnover or early retirement, which helps reinforce a career in public school teaching. The New Jersey Teachers’ Pension Annuity Fund (TPAF) has an ARC of 22.4 percent as a percent of payroll; however, the required cost or normal cost for providing a pension to teachers employed today is 10.4 percent as a percent of payroll (New Jersey Division of Pensions and Benefits 2011; KPMG 2016). The relatively high ARC, more than double the normal cost, is primarily attributable to the state’s failure to make annual required contributions since 1996. As a result of the Chapter 78 reforms in 2011, an increasing portion of the normal cost is borne by teachers and other education workers, and some pension benefits have been reduced. In 2016, normal cost paid by teachers was two-thirds of the pension funding while the state contributed one-third. The state’s contribution was considerably less than the 9.4 percent of compensation reported by the ECEC survey for retirement and savings (see Table 1). However, the ECEC survey does not include the cost of retiree health benefits. We rely on the state’s audited reports of the post-employment benefits fund for the normal cost of the retiree health benefits, which represents 3.0 percent of teacher compensation (KPMG 2016 and author’s calculations). Again, as a result of the Chapter 78 reforms, retirees pay more toward their medical services, and because the normal retirement age has been increased to 65 for the recently hired labor force, the health plan has increasingly become a Medigap program. Note: Due to rounding, numbers may not always add up to the precise totals. In developing a model to compare teachers with other workers or professionals, we rely on independent variables that predict earnings. We use an enhanced human capital model to compare teachers with other full-time employees in the New Jersey labor force that work more than 35 hours per week and more than 39 weeks per year. Public school teachers in the state of New Jersey are substantially more educated than other employees in New Jersey’s full-time labor force. We report demographic comparisons for the New Jersey resident labor force (see Table 2). Approximately 98.7 percent of full-time New Jersey public school teachers hold at least a bachelor’s degree, compared with 46.9 percent of other full-time employees. However, the distribution of educational degrees is different. Public school teachers are nearly four times as likely to hold a master’s degree (49.0 percent vs. 12.4 percent). On the other hand, other full-time employees are more likely to hold professional degrees (3.0 percent vs. 1.8 percent) or doctorates (2.0 percent vs. 1.0 percent). Despite holding relatively fewer of the most advanced degrees, New Jersey public school teachers are, overall, more highly educated than other full-time employees in New Jersey. Since higher educational levels are strongly associated with higher earnings, public school teachers should be expected to earn more than other employees in the full-time labor force. In fact, however, New Jersey full-time teachers are on average paid 16.9 percent lower salaries than other full-time employees in New Jersey ($68,301 vs. $82,223). Their total compensation—salary plus benefits—is on average 10.5 percent lower than that of other full-time employees ($95,703 vs. $106,912). 45.1 yrs. 43.5 yrs. 1.5 yrs. Notes: Differences are for New Jersey public school teachers relative to other full-time employees in New Jersey, and are measured as percentage point differences where the characteristic is a percentage (i.e., share female) and as percent differences for other characteristics (i.e., salary). Due to rounding, numbers may not always add up to the precise totals. The demographics of New Jersey public school teachers are highly distinctive and different from the demographics of New Jersey’s full-time labor force in general. As shown in Table 2, over three-quarters (75.4 percent) of New Jersey public school teachers are women, whereas considerably less than half (42.7 percent) of other full-time employees are female. New Jersey public school teachers are less likely to be black (6.8 percent vs. 9.7 percent), Hispanic (6.8 percent vs. 12.7 percent), or Asian (1.9 percent vs. 11.3 percent) than other full-time workers. They are also more likely to be U.S. citizens (99.4 percent vs. 90.4 percent). With respect to age (43.5 vs. 45.1 years old), New Jersey public school teachers on average are 1.5 years younger and are more likely to be married (69.4 percent vs. 65.4 percent) compared with others in the New Jersey full-time labor force. Substantial differences exist between these teachers and other full-time employees in terms of hours and weeks of work. Public school teachers report working fewer hours per week (41.7 vs. 43.5) and fewer weeks per year (47.5 vs. 51.2) than other full-time employees, which results in a 246.5 hour shorter work year (1980.5 vs. 2227.0) than that of other full-time workers. These reported differences lead us to the question: What are the most appropriate comparisons to make for teachers? Should we compare teachers’ annual wages, weekly wages, or hourly wages? Teacher contracts typically provide for a shorter work year than many other full-time workers. New Jersey teachers often have 8 unpaid weeks off in summers so they will likely have lower annual earnings unless they can supplement their income with additional work during that time, but teachers who desire to earn income over the summer cannot do so at the same rate of pay (Allegretto, Corcoran, and Mishel 2004; Allegretto and Mishel 2016). Consequently, a comparison of annual earnings is not a meaningful comparison of pay for time worked. Also, the time that many other workers, especially professionals, spend off the job for professional development is frequently included in measures of weeks worked, but is not included for teachers (Allegretto, Corcoran, and Mishel 2004). We rely on weekly and hourly earnings in this report. Nevertheless, a comparison of weekly or hourly pay may also understate the teacher wage disadvantage. Teachers may underreport their weeks and hours by not including meetings, grading, curriculum development, and preparation time after formal work hours end or outside of the formal school year. Since it is generally difficult to measure teacher work hours, we adopt the more conservative approach of reporting both hourly and weekly wage and compensation alternatives. If teacher weekly work hours are understated in the survey, then the estimate of the hourly wage penalty is understated. The ACS provides weeks worked per year measured in intervals of several weeks (e.g., 40 to 47 weeks), not the actual weeks worked. To remedy this shortcoming in the data, we estimate an equation using the Current Population Survey Annual Social and Economic Supplement (CPS-ASES) (Flood et al. 2015) that reports both actual weeks worked and weeks in intervals. We use the coefficients from this estimate of New Jersey employees and teachers to impute the weeks worked in the ACS data, which is used in this analysis. It should be noted the interval measure and the weeks worked estimate make little difference to the ultimate wage and compensation estimates. To assess the earnings of New Jersey public school teachers, we compare them with all other full-time employee earnings using the microdata from the American Community Survey. However, we delete imputed earnings from the data, which is a potential source of bias, and retain only the respondents’ reported earnings. The Census Bureau undertakes a process to assign wages to those who participate in the sample but do not provide earnings data. Using characteristics of the worker, the Census Bureau estimates the worker’s wage or imputes the wage. While ensuring a demographically representative sample, wage imputation introduces potential biases in wage estimates (Hirsch and Schumacher 2004; Allegretto, Corcoran, and Mishel 2004) because teachers are assigned imputed wages from higher-paid professionals. The teacher wage penalty is 2 percentage points larger (more negative) as a result of deleting the imputed wages. In summary, New Jersey public school teachers, on average, receive lower annual wages and compensation than other full-time employees in New Jersey. The structure of teacher compensation is different from that of most other employees since teachers receive a larger proportion of their compensation in employer-provided benefits, particularly health insurance. Teachers on average work fewer hours per week and fewer weeks per year than other full-time employees. Thus, to determine whether teachers are overpaid, our analysis asks whether higher health benefit costs and fewer annual hours of work are offset by the lower annual wages paid to teachers in New Jersey, given their education and experience. That is the question we turn to next. Note: Table reports the estimated coefficient and the standard error on the indicator for public school teacher. The weekly wage and compensation regression specifications include educational variables of some college, associate degree, bachelor’s degree, master’s degree, professional degree, and doctorate, and also controls for age, age squared, female, black, Hispanic, Asian, married, noncitizen, and weeks worked per year. The hourly wage and compensation regressions add usual hours of work per week. 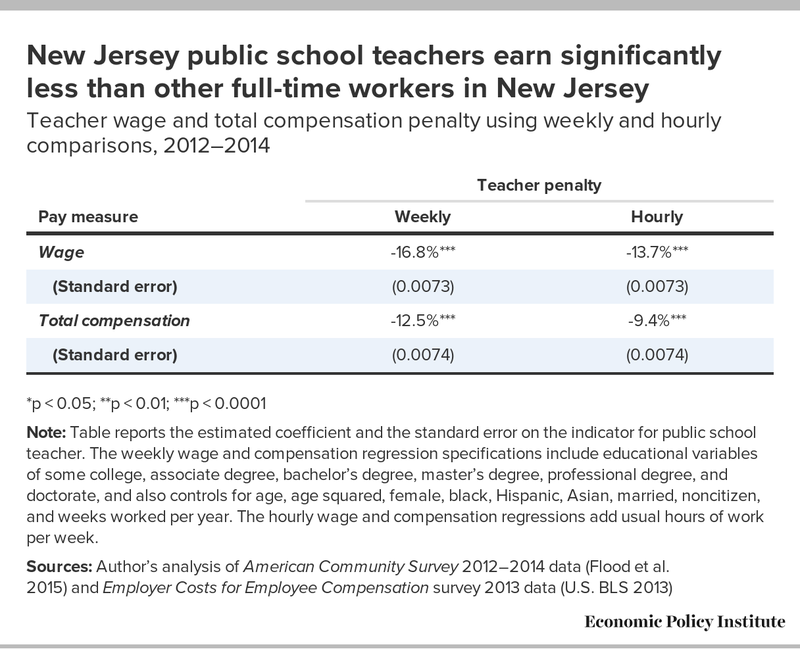 As can be observed by the estimates reported in Table 3, the teacher total compensation penalty is smaller than the teacher wage penalty, reflecting the greater cost of teachers’ benefits relative to the benefits of other New Jersey full-time employees. Controlling for weeks worked, teachers earn 16.8 percent lower weekly wages and 12.5 percent lower total weekly compensation than other New Jersey full-time employees. On an hourly basis, teachers are paid 13.7 percent lower wages and 9.4 percent lower total compensation. The hourly wage estimates control for both the shorter work year and fewer weekly hours of teachers. The basic regression specifications include educational variables of some college, associate degree, bachelor’s degree, master’s degree, professional degree, and doctorate, and also control for age, age squared, female, black, Hispanic, Asian, married, noncitizen, and weeks worked per year. The hourly wage and compensation regressions add usual hours of work per week. In summary, these estimates show that New Jersey teachers earn significantly less in wages and total compensation than comparable full-time employees in New Jersey. Given the relatively large sample size and the statistical power it permits, this analysis concludes that New Jersey public school teachers are paid 9.4 percent less in hourly compensation than other full-time New Jersey employees of comparable education and experience, taking into account their fewer hours per year and the more generous benefits they receive (primarily health insurance). New Jersey public school teachers earn 13.7 percent less in hourly wages than New Jersey employees of comparable education and experience. New Jersey public school teachers are not overpaid. The earnings equation estimates indicate that New Jersey public school teachers are not overpaid relative to other New Jersey residents who work full time. Rather, public school teachers are paid less than other New Jersey workers with comparable levels of experience and education. That is, when we make comparisons controlling for education, experience, weeks worked per year, hours of work, gender, race, ethnicity, citizenship, and marital status, teachers earn lower wages and receive less in total compensation (including all benefits) than other full-time workers with comparable education, experience, and other characteristics. Therefore, New Jersey public school teachers are in fact undercompensated. How does gender, racial, and ethnic pay equity among New Jersey public school teachers compare to equity among other full-time employees in New Jersey? More than three-quarters (75.4 percent) of New Jersey public school teachers are women, compared with 42.7 percent of the full-time labor force. It is well established that occupations with a greater share of females pay less than those with a lower share, controlling for education and skill (Levanon, England, and Allison 2009). Gender segregation of an occupation influences pay for all members of that occupation, male or female: the greater the share of women in an occupation, the lower the pay will be for both women and men in that occupation. The lower pay is most likely owing to the devaluation in general of work done by women and, for teachers in particular, the devaluation of the nurturing work that teachers provide (Levanon, England, and Allison 2009). 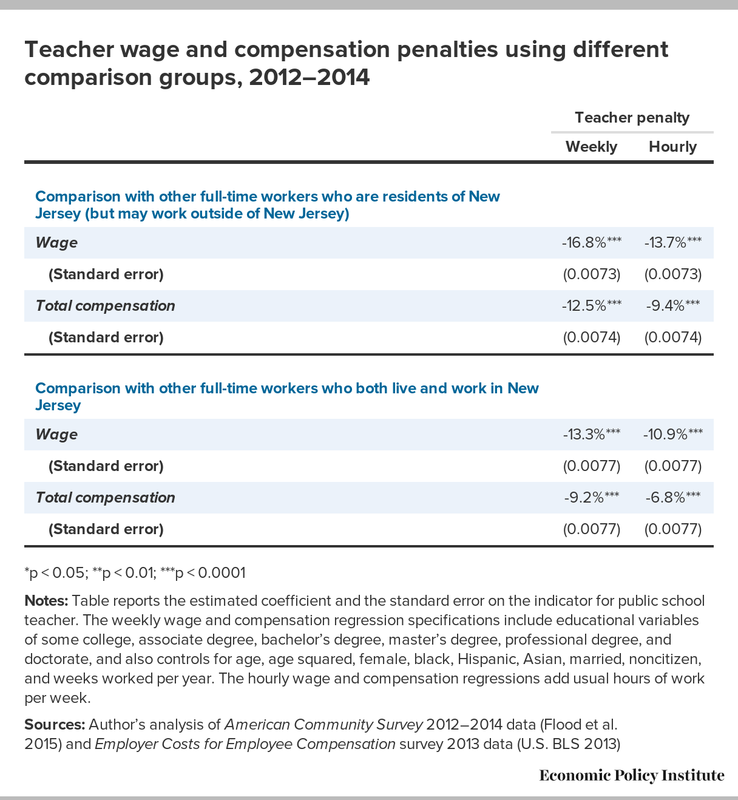 As Table 4 shows, the resulting New Jersey male teacher wage penalty is substantial—35.9 percent for weekly wages—when male teachers are compared with similar full-time male employees. On an hourly basis the male teacher wage penalty is 31.4 percent. 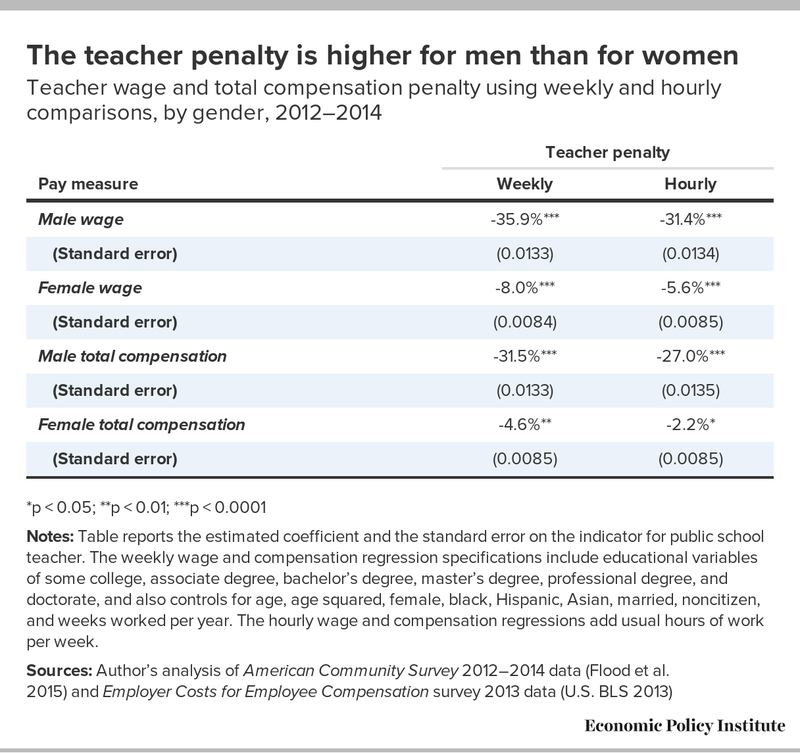 The male teacher compensation penalty is smaller than the wage penalty but is still substantial, with a weekly penalty of 31.5 percent and an hourly compensation penalty of 27.0 percent. The female wage penalty is considerably smaller, ranging from 8.0 percent on a weekly basis to 5.6 percent on an hourly basis, suggesting that female teachers have fewer better-paying opportunities outside the teaching profession than male teachers do; such limits to women’s opportunities likely further contribute to the occupational segregation of the teaching profession (see Table 4). The total compensation penalty for female public school teachers in New Jersey is 4.6 percent on a weekly basis and 2.2 percent on an hourly basis. Notes: Table reports the estimated coefficient and the standard error on the indicator for public school teacher. The weekly wage and compensation regression specifications include educational variables of some college, associate degree, bachelor’s degree, master’s degree, professional degree, and doctorate, and also controls for age, age squared, female, black, Hispanic, Asian, married, noncitizen, and weeks worked per year. The hourly wage and compensation regressions add usual hours of work per week. As discussed above (see Table 2), women are overrepresented in the teaching profession in New Jersey public schools compared with their representation in other professions; whites are also overrepresented (84.5% percent vs. 66.3% percent), as can be seen from the fact that other groups are underrepresented, including Asians (1.9 percent vs. 11.3 percent), blacks (6.8 percent vs. 9.7 percent) and Hispanics (6.8 percent vs. 12.7 percent). Further investigation is required to determine the causes of these demographic imbalances in the teaching profession. It would be particularly helpful to explore the reasons why minorities are underrepresented so that the situation can be remediated, since underrepresentation of minorities may impact the quality of education (Egalite, Kisida, and Winters 2015). Table 5 presents estimates of the gender, racial, and ethnic wage gaps among public school teachers and among other full-time workers in New Jersey, controlling for education, experience, and other factors. We find that less gender inequity exists among the teachers than among the other members of the full-time labor force: female public school teachers in New Jersey earn 5.4 percent less than male public school teachers, while among all other workers females earn 22.1 percent less than their male counterparts. Similarly, black teachers earn 6.1 percent less than white teachers, controlling for education, experience, and other factors, while in the broader labor market blacks earn 13.3 percent less. Hispanic teachers earn wages moderately below (by 1.7 percent and statistically insignificant) those of whites, controlling for education, experience, and other factors, but in the wider labor force Hispanics earn 21.4 percent less. It should be noted that these results control for citizenship, which might be expected to affect the estimated effect of being Hispanic. In contrast, the Asian penalty is higher among New Jersey public school teachers than among other employees in the New Jersey labor force. The Asian teacher earnings penalty is 13.7 percent, whereas the penalty for Asians in the full-time labor force is 6.4 percent. This considerable reduction in pay inequity for women, black, and Hispanic teachers is in part attributable to transparent pay systems dictated by collective bargaining agreements and also existing in the public sector more generally. By making pay transparent, collective bargaining agreements open pay to the scrutiny of all and strengthen forces for internal equity among teachers. Collective bargaining agreements also often set wages based on education and years of experience—for example, teachers with a bachelor’s degree and 10 years of experience would earn the same wage, regardless of gender, race or ethnicity—thereby limiting the scope for possible pay discrimination. Wage differences will still arise in these estimates because of pay differentials that exist among school districts and our inability to control for job tenure in the regressions. Additionally, the small Hispanic pay gap may be partly attributable to the high demand for bilingual teachers in the many diverse school districts in New Jersey. The relatively large pay penalty for Asian teachers is not readily explained by this data; however, it may reflect a clustering of Asian teachers in the early stages of their careers, working in programs such as Teach for America, or working in charter schools, and thus at the bottom of the pay progressions. This clustering may be attributed to a relatively high turnover of Asian teachers early in their teaching careers as they pursue better-paying alternatives in the full-time labor market. Nonetheless, public school teacher pay in New Jersey overall displays much greater pay equity than we observe among other full-time employees. Notes: Table reports the estimated coefficient and the standard error on the indicator for the specific demographic group. The weekly wage and compensation regression specifications include educational variables of some college, associate degree, bachelor’s degree, master’s degree, professional degree, and doctorate, and also controls for age, age squared, female, black, Hispanic, Asian, married, noncitizen, and weeks worked per year. The hourly wage and compensation regressions add usual hours of work per week. Greater pay equity among public school teachers has been enabled by the transparent environment and standardization of pay provided by collective bargaining. Under collective bargaining agreements, pay schedules are determined without regard to a gender, race, or ethnicity, and so pay gaps among public school teachers are considerably smaller than those among other employees in the full-time labor force. Teachers’ unions have a positive impact on pay equity. With the exception of the Asian pay gap, pay gaps are smaller among New Jersey public school teachers than among other full-time workers. This is at least partly attributable to the effects of collective bargaining agreements. We therefore conclude that teachers’ unions have a positive impact on pay equity. Does union membership improve teacher compensation? While we find that New Jersey teachers are undercompensated, we cannot infer that teachers’ unions have not improved teachers’ wages and benefits. This section reports on a national sample comparing the compensation of union and nonunion public school teachers across the United States in order to answer the question: Does union membership improve teacher compensation? Prior survey research reports that teachers join unions to support the unions’ collective bargaining activities and to further the unions’ political goals (Moe 2011). Even among non–union members in what tend to be conservative, nonunion contexts, 42 percent say that they, too, would like to see collective bargaining adopted in their district. This means that, in the aggregate, collective bargaining actually has the support of 57 percent of all teachers who work in non-bargaining districts (Moe 2011). Teachers want their unions to protect their jobs and to negotiate good salaries and benefits (Rosenberg and Silva 2012). When asked how satisfied they are with their union as a whole, 77 percent of union members say they are either very or somewhat satisfied (Moe 2011; Rosenberg and Silva 2012), and the percentages are virtually the same across districts, regardless of whether the districts engage in collective bargaining (Moe 2011). When asked about the effects of collective bargaining, 83 percent think that contract rules promote student learning, 70 percent think that seniority-based transfer rights make schools more effective, and 62 percent think that principals are liable to abuse their discretionary powers and need to be restricted by contract rules (Moe 2011). More than three-quarters of teachers today (including more than 70 percent of new teachers) say that, absent the union, their working conditions and salaries would suffer (Rosenberg and Silva 2012). Majorities also agree that without the union they would be more vulnerable to school politics and would have nowhere to turn in the face of unfair charges by parents or students (Rosenberg and Silva 2012). Fully 84 percent say their union protects teachers through due process and grievance procedures, with 71 percent of teachers giving “excellent” or “good” ratings to their unions (Rosenberg and Silva 2012). Union teachers were found to be more enthusiastic about teaching and less likely to leave for better-paying jobs (Gius 2013). In this section of the report, we explore whether teachers’ unions improve teacher earnings. Prior research offers mixed results. For example, Frandsen (2014) reports, in his panel data analysis, that collective-bargaining laws have had a minimal effect on public school teachers’ hourly wages, whereas an analysis using data from the 1980s (Zwerling and Thomason 1995) finds a 5 percent union wage premium for teachers, which increases by 2.6 percent with each 10-percent increase in teacher union density. To summarize, prior research is inconclusive as to whether unions have had an impact on public school teachers’ wages. In this study, we use the Current Population Survey Outgoing Rotation Group (CPS-ORG) for the years 2013 to 2015 (Flood et al. 2015) to look at the union question. We compare the earnings of union and nonunion teachers across the United States. In comparing union and nonunion teachers, we control for education, experience, gender, race, ethnicity, marital status, and weekly hours of work. The results indicate that, in the United States, teacher union membership results, on average, in 13.2 percent higher wages and 13.5 percent higher total compensation for its members when compared with the compensation of public school teachers who are not union members. Teachers’ unions produce real measurable earnings improvements for their members. While teachers’ unions have thus far been unable to fully offset the counter-forces restraining teacher compensation, they do make a positive difference in teacher compensation. If teachers are to continue making gains toward equitable compensation, teachers’ unions must be safeguarded against the forces that seek to undermine their political and economic power and that seek to privatize public education by redirecting funds to charter schools and voucher systems. This report investigates several research questions. The first is: Are New Jersey public school teachers overpaid at the expense of New Jersey taxpayers? We find that public school teachers are in fact undercompensated in New Jersey. The data analysis also reveals substantially different approaches to staffing and compensation between school districts and other New Jersey employers. On average, New Jersey teachers are more highly educated than other full-time employees; 98.7 percent of New Jersey public school teachers hold at least a 4-year college degree compared with 46.9 percent of other employees in the full-time labor force. Yet for college-educated labor, New Jersey school districts pay significantly less than do other employers in New Jersey. 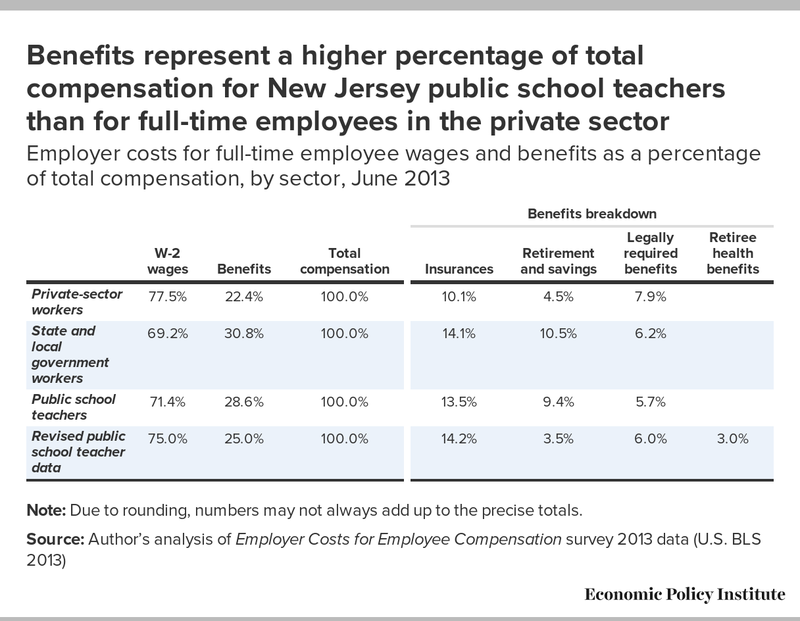 Compensation is allocated differently for public school teachers in New Jersey than it is for employees in other fields. Teachers receive a higher proportion of their compensation in the form of employer-provided health benefits, and the mix of benefits is different from that of other members of the workforce. Public education employers provide better health benefits than other employers do for both the active and retired segments of the workforce. Teachers also continue to participate in a defined benefit plan managed by the state (though, as mentioned earlier, this plan has been inadequately funded for more than two decades), while other sectors of the labor force outside of public education have switched to defined contribution plans, usually 401(k) plans. On the other hand, teachers receive considerably less paid vacation time, and their employers contribute significantly less to legally mandated benefits since the contribution requirements are different for the public sector. An earnings equation produces what some may consider a surprising result: full-time teachers are underpaid by 13.7 percent when compared with other full-time employees working comparable annual hours. The teacher total compensation penalty is smaller—9.4 percent on an hourly basis—when teachers are compared to other full-time employees. This result is consistent with other research on teachers. Allegretto and Tojerow (2014) use Current Population Survey data to compare teacher pay in the United Stares with wages of non-teacher professionals with similar characteristics and found that the overall teacher wage penalty for unionized public-sector teachers grew from 10 percent in 1996 to 15 percent in 2010. Their research also finds that the wage gap between private-sector teachers and non-teachers with similar education and experience is smaller among unionized teachers than among nonunion teachers. The teacher wage penalty has grown to 15 percent for unionized public-sector teachers, to 19 percent for nonunion public-sector teachers, and to 30 percent for nonunion private-sector teachers (Allegretto and Tojerow 2014, 20). When focusing on one or another component of compensation for comparison, it is easy to miss the essential point that different employee groups have different preferences and respond differently to various mixes of compensation. For example, young people have a greater preference for cash, while older workers prefer retirement benefits. Since it is impossible to assess the relative “value” of different types of compensation to different employees, what citizens need to focus on in this debate is the cost of comparable levels of total compensation, controlling for education, experience, hours of work, and other characteristics that influence employee productivity. When we look at overall compensation, we learn that New Jersey public school teachers more than pay for their better health benefits and fewer hours of work through lower salaries than comparable full-time employees. 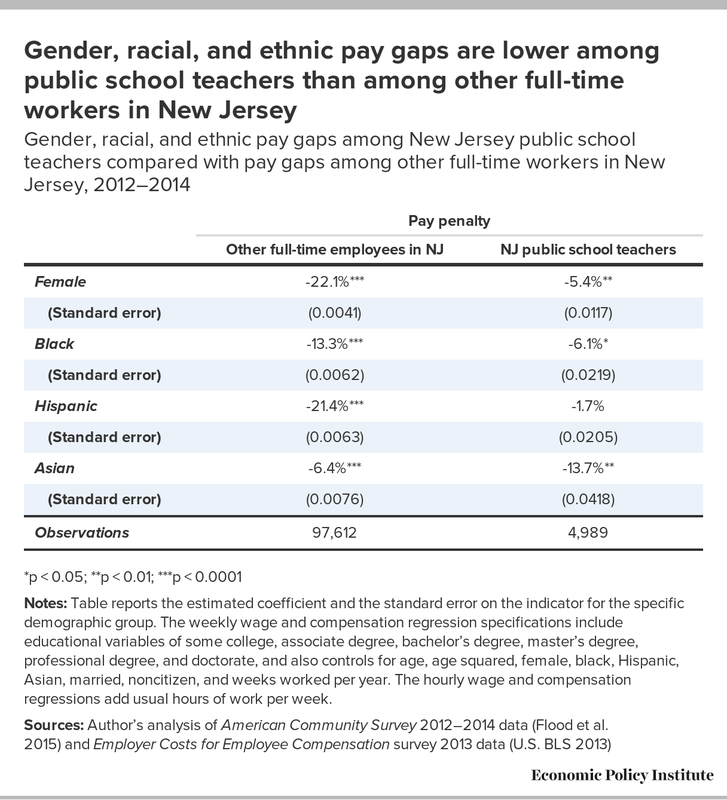 The second question addressed in this report is: How do public school teachers compare with other New Jersey full-time employees in terms of pay equity? Teaching is a predominantly female profession and as such is gender-typed, which is associated with a pay penalty for both male and female teachers. The male teaching wage and compensation penalty is substantial, only reinforcing the fact that gender segregation has lowered the wages of teachers. This report explores the gender, race, and ethnic differentials among New Jersey public school teachers compared with other full-time employees. We find that wage penalties for female, black, and Hispanic public school teachers in New Jersey are considerably less than they are for other full-time employees in the New Jersey labor force. In part, this reduction in earnings gaps has been facilitated by the transparency of collectively bargained pay schedules. However, further investigation is required to understand why Asians, blacks, and Hispanics are underrepresented in the teaching profession, as well as the sources of the relatively large earnings penalty for Asian teachers. The third question is: Do teachers who are unionized benefit from collective bargaining in terms of wages and benefits compared with nonunion public school teachers? We find that teacher union membership on average results in 13.2 percent higher wages and 13.5 percent higher total compensation when compared with public school teachers who are not union members in the United States. While even unionized teachers are undercompensated, weakening teacher unions would only lead to an increase in the pay penalty for teaching. Rather than being a cause of excessive compensation, unionization is a counterbalance to downward pressures on compensation. It is well known that taxpayers in general oppose higher taxes and thus exert considerable pressure on elected representatives to resist increases in government employee compensation, creating a formidable incentive and opportunity to hold government pay below market. Unionization represents a viable legal response to employer labor market power in public education. Jeffrey H. Keefe is Professor Emeritus of Labor and Employment Relations at the School of Management and Labor Relations, Rutgers University, where he has conducted research on labor markets, human resources, and labor-management relations to inform policy. He earned his Ph.D. at Cornell University. Allegretto, Sylvia A., Sean P. Corcoran, and Lawrence Mishel. 2004. How Does Teacher Pay Compare? Methodological Challenges and Answers. Washington, D.C.: Economic Policy Institute. Allegretto, Sylvia A., and Lawrence Mishel. 2016. The Teacher Pay Gap Is Wider Than Ever: Teachers’ Pay Continues to Fall Further behind Pay of Comparable Workers. Economic Policy Institute Report. Allegretto, Sylvia A., and Ilan Tojerow. 2014. “Teacher Staffing and Pay Differences: Public and Private Schools.” Monthly Labor Review, September. Aon Hewitt. 2016. State of New Jersey Postemployment Benefits Other Than Pension Actuarial Valuation for the Fiscal Year Ending June 30, 2015. Arco, Matt. 2015. “Christie Comes out Swinging at N.J. Teachers’ Union in N.H.” August 19, NJ Advance Media for NJ.com. Brainard, Keith, and Alex Brown. 2015. The Annual Required Contribution Experience of State Retirement Plans, FY 01 to FY 13. National Association of State Retirement Administrators, March. Education Week Research Center. 2016. “2016 Education Rankings Put States, Nation to the Test.” Education Week, Jan. 26. Egalite, Anna J., Brian Kisida, and Marcus A. Winters. 2015. Representation in the Classroom: The Effect of Own-Race/Ethnicity Teacher Assignment on Student Achievement. Flood, Sarah, Miriam King, Steven Ruggles, and J. Robert Warren. 2015. Integrated Public Use Microdata Series, Current Population Survey: Version 4.0. [dataset]. Minneapolis: Univ. of Minnesota. Frandsen, Brigham R. 2014. The Effects of Collective Bargaining Rights on Public Employee Compensation: Evidence from Teachers, Fire Fighters, and Police. Brigham Young University. Fronstin, Paul, and Nevin Adams. 2012. Employment-Based Retiree Health Benefits: Trends in Access and Coverage, 1997‒2010. Employee Benefit Research Institute Issue Brief no. 377, October. Gius, Mark. 2013. “Unions, Right-to-Work Laws, and Job Satisfaction in the Teaching Profession.” New York Economic Review vol. 44, no. 1, 20–31. Hirsch, Barry T., and Edward J. Schumacher. 2004. “Match Bias in Wage Gap Estimates Due to Earnings Imputation.” Journal of Labor Economics vol. 22, no. 3, 689–722. Kaiser Family Foundation. 2015. Employer Health Benefits 2015 Annual Survey. KPMG. 2016. New Jersey Fiscal Year Annual Report: Comprehensive Audited Financial Statement Report for 2015, March 8. Layton, Lyndsey. 2015. “Chris Christie to Teachers Union: You Deserve a Punch in the Face.” Washington Post, August 3. Levanon, Asaf, Paula England, and Paul Allison. 2009. “Occupational Feminization and Pay: Assessing Causal Dynamics Using 1950–2000 U.S. Census Data.” Social Forces vol. 88, no. 2, 865–981. Magyar, Mark J. 2014. “NJ Public Employees Pay High Percentage of Healthcare Costs.” NJ Spotlight, November 18. Moe, Terry M. 2011. Special Interest: Teachers Unions and America’s Public Schools. Washington, D.C.: Brookings Institution Press. New Jersey Charter Schools Association. 2017. New Jersey Division of Pension and Benefits. 2011. Pension and Health Benefits Reform under Chapter 78, P.L. 2011. Division of Pensions and Benefits, Department of the Treasury, State of New Jersey. Rosenberg, Sarah, and Elena Silva. 2012. Trending toward Reform: Teachers Speak on Unions and the Future of the Profession. Education Sector Reports 2012. Spina, Mike. 2011. Teachers under Attack: How NJ Governor Chris Christie’s Personal Vendetta against Teachers Will Destroy Public Education. Xlibris. U.S. Census Bureau. 2015. Per Pupil Spending Varies Heavily across the United States [press release], June 2, Release Number: CB15-98. U.S. Congress Joint Committee on Taxation. 2006. Estimates of Federal Tax Expenditures for Fiscal Years 2006–2010. Washington, D.C.: U.S. Government Printing Office. U.S. Department of Labor, Bureau of Labor Statistics (U.S. BLS). 2013. Employer Costs for Employee Compensation (with unpublished detailed compensation data for the Mid-Atlantic Census Division), June. Zwerling, Harris L., and Terry Thomason. 1995. “Collective Bargaining and the Determinants of Teachers’ Salaries.” Journal of Labor Research vol. 16, no. 4, 467–84. This appendix describes two decisions we made: (1) how to measure benefits and (2) whether to examine the sample of full-time workers who both work and live in New Jersey or the sample of full-time workers who live in New Jersey (but may work in other states). In the case of New Jersey, the amortization payments have become substantial; however, they are still below the annual required contribution. To assess the current cost of employee benefits, we adjusted the ECEC pension costs to reflect the normal cost of the teacher pension and the normal cost of retiree health benefits. The New Jersey Teachers’ Pension Annuity Fund (TPAF) has an ARC of 22.4 percent as a percent of payroll; however, the required cost or normal cost for providing a pension to teachers employed today is 10.4 percent as a percent of payroll (New Jersey Division of Pensions and Benefits 2011; KPMG 2016). The high ARC, more than double the normal cost, is primarily attributable to the state’s failure to make the annual required contributions since 1996. As a result of the Chapter 78 reforms in 2011, an increasing portion of the normal cost is borne by teachers and other education workers, and pension benefits are reduced. For the 2014–2015 school year, the normal cost paid by teachers was 6.92 percent as a percent of payroll and the state’s contribution was 3.46 percent as a percent of payroll, considerably less than the pension cost of 9.4 percent included in the ECEC survey. However, the ECEC survey does not include the cost of retiree health benefits. We rely on the state’s audited reports of the post-employment benefits fund for the normal cost of the retiree health benefits and calculate the normal costs as a percent of payroll (Aon Hewitt 2016). We divide the normal costs of retiree health benefits by the total salary of the active education labor force to develop an estimate of the retiree health benefit costs per teacher to be used in marking up wages as a component of compensation costs. Again, it should be noted that, as a result of the Chapter 78 reforms, retirees pay more toward their medical services, and because the normal retirement age has been increased to 65 for the recently hired labor force, the health plan has increasingly become a Medigap program. Using the actuarial data, we estimate that the normal cost for retiree health benefits is 2.98 percent as a percent of payroll for education employees, which is 3.0 percent of total teacher compensation. On the other hand, we do not make any adjustments to the ECEC estimates for private-sector employees for pensions or retiree health benefits. In contrast to public employees, only 13 percent of private-sector employees in 2013 participated in defined benefit pension plans (Employee Benefit Research Institute 2016); most of those who had pensions were in defined contribution plans, in particular 401(k) plans. This largely makes an adjustment for prior underfunding of defined benefits plans unnecessary. According to the ECEC survey, private-sector employers contribute 6.8 percent as a percent of payroll to retirement plans. The ECEC survey also does not include the costs of retiree health benefits for private-sector employers or other public-sector employer contributions to retiree health plans. Among large private-sector firms (200 or more workers), approximately 23 percent offered retiree health benefits to their employees in 2015, while 42 percent of very large firms (5,000 or more workers) offered retiree health benefits (Kaiser Family Foundation 2015, 186). Another survey indicates that 16 percent to 18 percent of private-sector workers were employed by firms that provided employee retiree health benefits in 2010 (Fronstin and Adams 2012). We simply lack the information to assess the normal costs of providing these benefits to private-sector employees. As a result, we do not include a markup for the cost of employer retiree health benefits for private-sector or other public-sector employers. By not including the costs of retiree health, we understate private-sector compensation costs. 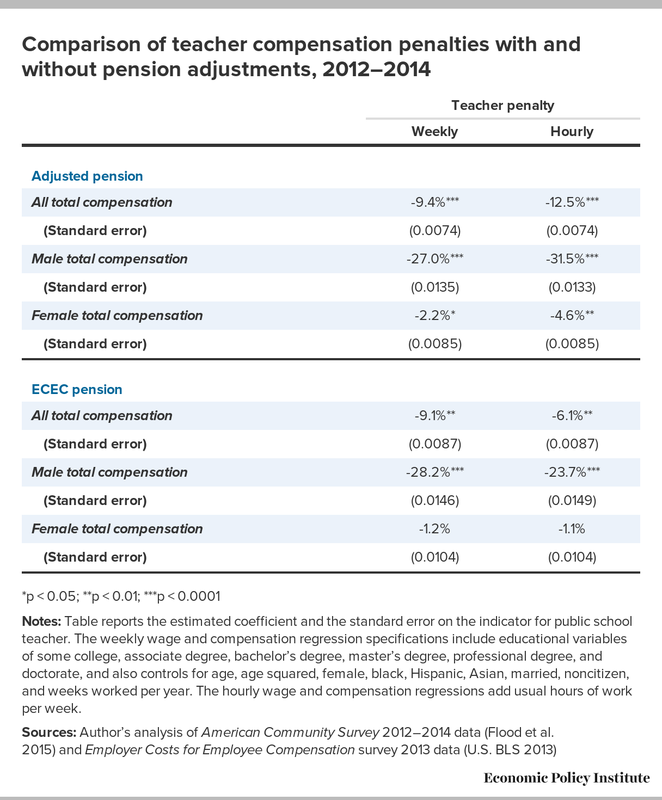 These adjustments result in lower overall cost of teacher benefits as compared with those reported in the ECEC’s Mid-Atlantic estimates, as shown in Table A-1, estimates of the teacher pay penalty where the top section of Table A-1 shows the results with the pension data adjusted, as described above, and the bottom section of Table A-1 uses the pension contributions as reported. On average the adjustments, when we compare the two sections of Table A-1, result in a roughly 3 percentage point increase in the teacher penalty. However, even without these adjustments, a significant teacher compensation penalty—6.1 percent—exists, as reported in Table A-1. We believe these pension and retiree health benefits adjustments are necessary to reflect the actual costs of current employee benefits. Both New Jersey and Pennsylvania face substantial challenges in making their amortization payments, which have been made necessary by past fiscal irresponsibility. However, these payments for past state government failures do not belong in an accounting of the current cost of the employment of teachers. The ACS provides us with two potential samples of New Jersey residents with demographic characteristics such as full-time status, education level, age, gender, race, ethnicity, citizenship, marital status, weekly hours of work, and weeks worked per year. One sample allows us to compare public school teachers with full-time employees who reside in New Jersey, even if they work out of state (for example, in New York City or Philadelphia). A second sample allows us to compare public school teachers with only those workers who both work in and reside in New Jersey. In the report we rely on the sample of those who reside in New Jersey regardless of where they work. The resident labor force, which includes, for example, commuters to New York, reflects those who are clearly available to work in New Jersey; they also represent a highly educated potential teacher labor supply, and the labor market they participate in may offer attractive opportunities for teachers looking to leave the teaching profession. This sample also appropriately represents those workers who are New Jersey taxpayers: in light of the many assertions that teacher pay disadvantages taxpayers, it is logical to assess that claim by comparing public school teacher pay with that of other taxpayers in comparable full-time jobs. The top section of Table A-2 shows the earnings comparison we use for the study, which is also reported in Table 3 above. The bottom section of Table A-2 shows the alternative earnings comparison that we do not use for the study, comparing New Jersey public school teachers only with those New Jersey residents who work full-time in New Jersey. All estimates consistently show substantial wage and compensation penalties; however, limiting the comparison to those who work in New Jersey reduces the penalties by roughly 3 percentage points.